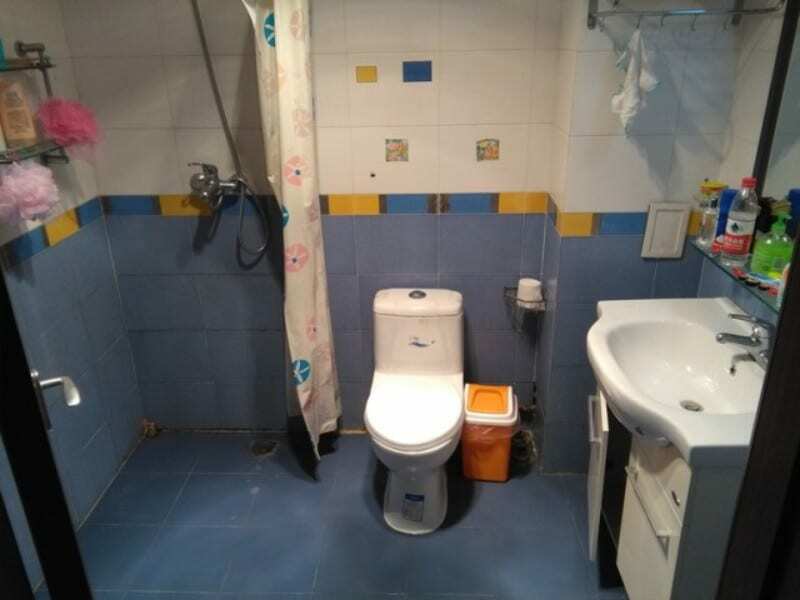 Living in a Chinese apartment was something that I was really looking forward to! I spent so many hours trawling the internet before we had even signed a contract looking at other people’s apartments, and researching on what to expect in relation to price and standards.The cost of living in Beijing depends on your lifestyle, but generally it’s very low for ESL teachers. Housing is the most expensive aspect of most people’s lives, so take a look at ours to get an idea of what you could buy for your budget. When we finally settled on moving to Beijing, I was annoyed that there weren’t as many videos or photos to look at of Chinese apartments. 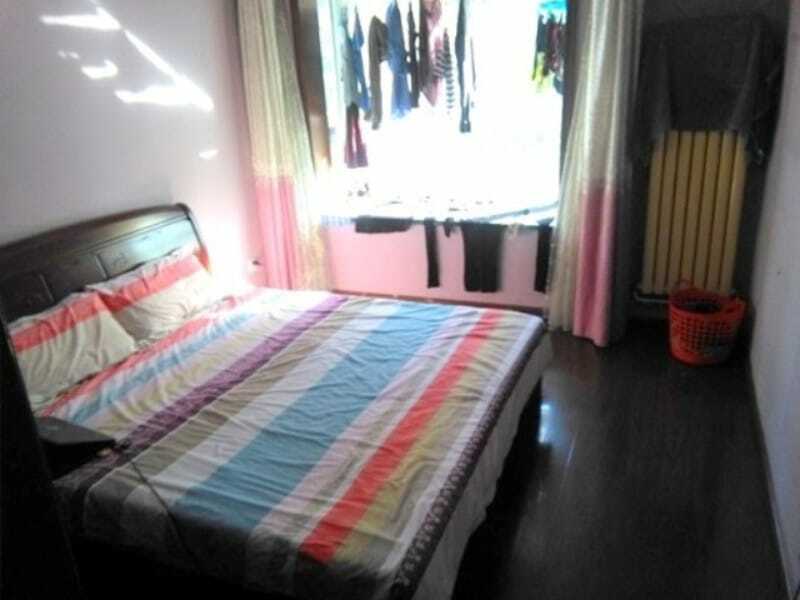 We are really lucky with ours so I thought I would share some pictures – we are only paying 4000RMB (£400) per month for this two-bedroom in Beijing, which is incredible. You wouldn’t even get a room in a smelly London flat for that price! Our living room is spacious and light, but it’s also been equipped with the world’s most uncomfortable sofa, as well as the oldest TV known to man. We weren’t really too worried about this when we signed because we didn’t actually test the sofa, and we can’t understand Chinese anyway so were sure that our Netflix account would suffice! In hindsight, we probably would have asked the landlord to buy more comfortable seating or at least some pretty cushions because it’s ridiculous to have springs digging in to the daintiest of body parts. Also, watching television on our laptop is fine but it means searching for something specific that you want to watch and then sitting down to watch it – sometimes it would be nice just to have some background noise whilst we’re lesson planning or cooking. We also have a small dining area which is where we eat, plan lessons and sometimes watch TV. It opens out the apartment which is nice because each room is very accessible. Our kitchen matches the lime green colour of the sofa and it’s blindingly gross but it could be a lot worse I guess! 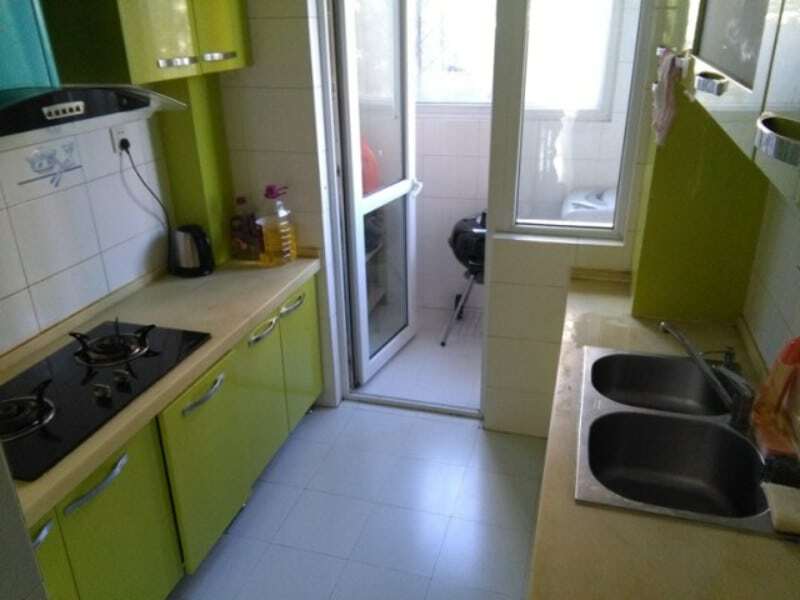 We actually now have a small oven which sits next to the sink, but apart from that, this is a typical Chinese apartment as it only has two hobs. There’s plenty of cupboard space but there’s limited counter space so making a big meal can sometimes get frustrating! 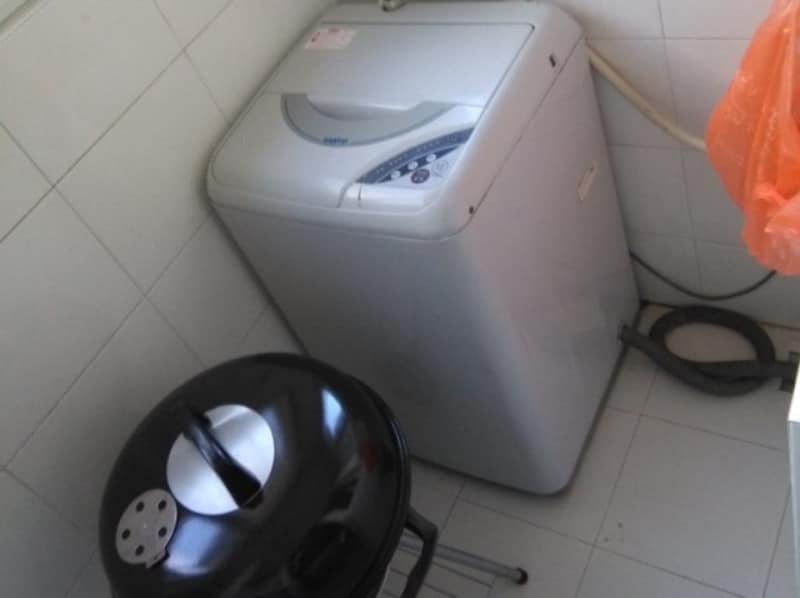 The washing machine itself only washes in cold water, which I think is a standard in most Chinese apartments but it’s infuriating for us! I personally can’t see how cold water can wash as well as hot water, so we boil a big pan and sometimes use the hot shower water to top up the wash – very annoying and we’ll be looking for a proper washing machine next year! Our bathroom is, again, typically Chinese! Although not so Chinese that we have to squat when we use the toilet…that’s western thankfully! The shower is just a shower head hidden behind a curtain, so the floor becomes flooded each time we shower. It drains pretty well but it can be annoying if one of us showers then the other needs the toilet – soggy socks are just the worst! The main bedroom is quite basic but we don’t spend too much time in there any more – just when we sleep! There’s a wardrobe across the whole length of the wall opposite the window, so that serves us pretty well. The bed is rock hard but that’s to be expected in China. Next year we’ll look into finding a mattress topper because we’ve had a few neck and shoulder problems that we’re putting down to sleeping on almost a solid wooden mattress! Finally….the unwanted spare room! Actually, it’s been quite useful for storing stuff and for when people stay over, but we didn’t actively look for a two bedroomed apartment. The agency told us there were no one bedroom places available, and to be honest this one was so cheap that it was just a nice little bonus. We told ourselves that we could use this for when we need to plan lessons or do any blog work, but the desk has become more of a storage space for now! So there you have it! A little insight into our Chinese apartment. Was it what you expected? Have you seen any better or worse places to live in China? Comment below and let us know! What a cute little space!! I was under the impression that apartments in China were expensive, that’s cheaper than what’s in my area! For 400 British pounds/500 US$, you might get a one bedroom (in Wisconsin, though it varies from state to state) or just an apartment with a combined bedroom/living room. You’re totally right, the price is nothing compared to the UK. However we are a little out of the centre so that makes a little but of a difference. We are still only 20 minutes from the centre though! That’s quite a nice place you have found there, especially in China and for a good price too. Oh, don’t remind me of those hard matresses! This year our matress was so hard we had to go to IKEA and buy a new bed and mattress, we couldn’t actually sleep on it, we slept on the sofa for a month. That was a great tour of your apartment. I love posts like this, and actually the sofa looks nice – too bad that it doesn’t feel nice. The sofa looks nice, photos can be extremely deceiving haha! Every bump you can see in the photo is the end of a large spring. You cannot sit on that sofa full stop. Looks like a really great place you guys have found over there and for a good price too! Yer it is, a little too big if i’m honest. The price over here is so good. What a great place. You are all set up. I love it. China is such a great place to live. I can’t wait to read more. Thanks for sharing, it’s a nice little insight into what is available in China. It’s actually quite a nice looking and spacious apartment. It’s very spacious, too spacious for two people. When we adopted the kittens it was nice but still difficult to clean! I recall when I had an adventure like this. I went to Japan, solo, to teach English. It was the best experience! Best of luck to you. I have never seen the inside of a Chinese apartment, but it looks no different to an apartment anywhere in the world. It does look like its nice and bright and I guess in some countries just having hobs is pretty standard. Not sure I could cope with the sofa though, maybe I would be buying lots of cushions to sit on!! Exactly, it’s a nice insight into what China is like. Nice and so reasonably priced. And in Beijing! We are outside the third ringroad where this sort of price is completely normal. People live in the center, which is only 20 minutes away, and pay triple the amount. Having traveled to many places but never to extended stays or relocating, this is a challenge that I had never thought of before. It looks like you took everything in stride though. I may date myself, but the styles in the home remind me of what I grew up with a kid in the 70’s. Whoever thought lime green made a good choice for appliances must have been doing some of those phsycodelic drugs back then. Haha, The amazing thing is i think all of the furniture and kitchen actually do come from the 70’s. The stuff in this apartment is very very old. I think it’s a cute apartment! I would have thought to live in such a major city would be more expensive. I was paying 400 euro for a similar setup in Chiang Mai, Thailand. Having a second bedroom can really come in handy! The price has gone up this year, for a smaller apartment in the same area is 4500. Also the second bedroom was just a dumping ground for us, I hope you got more use out of yours. The lime green colour make your flat so refreshing and relaxing. It could be a nice oasis for living in populated Beijing ! I wish that was the case. We couldn’t even sit on the sofa for more than 5 minutes and I speant the whole year on the wooden dining room chairs haha! That’s actually a pretty nice apartment for a fraction of what it would cost in London! And you can cope with the limey green kitchen…maybe some decals ha ha! But it looks quite roomy. Really cool to get a glimpse of it inside so thanks for sharing these photos! The one thing this place was is roomy, if everything else was replaced then we would have been ecstatic! 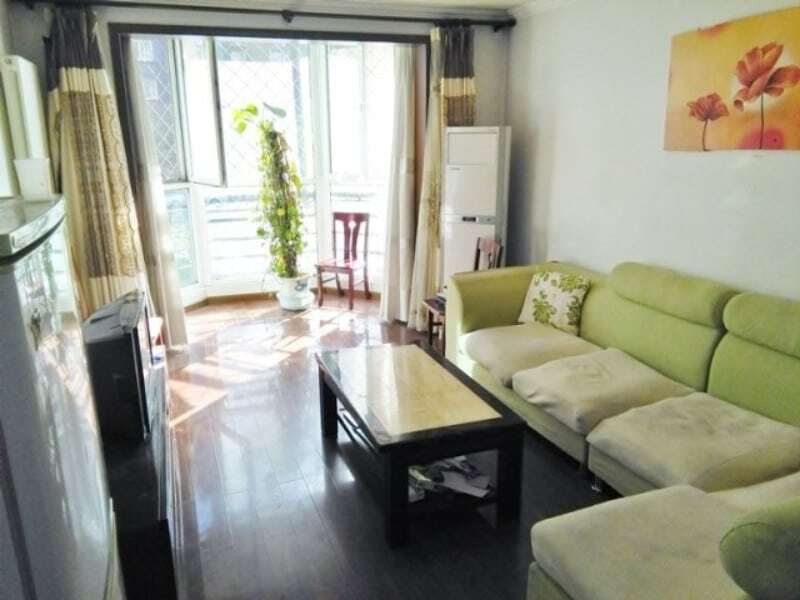 I’m moving to Beijing in Jan/Feb 2018, and I have been searching the net for an idea of what an apartment would look like and how much it would cost. My company is going to give me a 4850 RMB housing allowance. I am wondering if you could give me an insight on what to expect if I am looking for a 1Bed or Studio apartment. Is this a good allowance for housing? 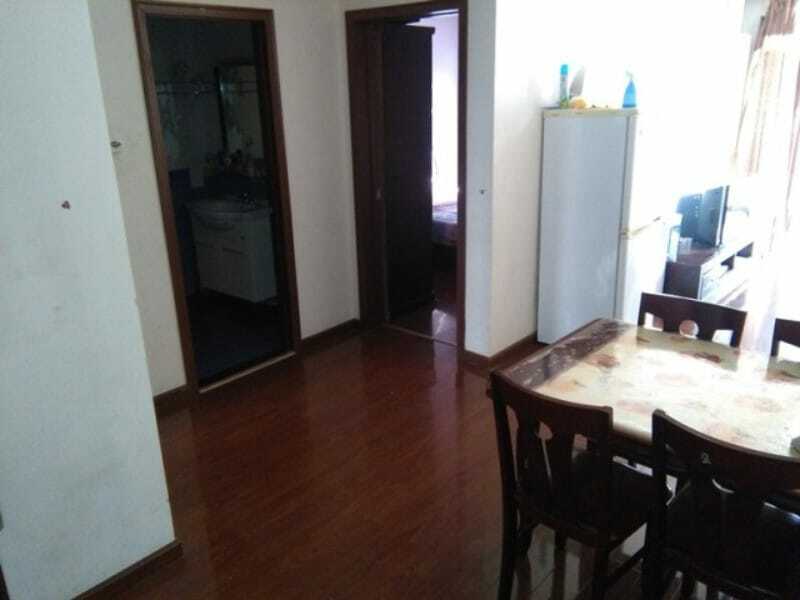 SO if you want to go close to the center that will get you a pretty small studio and outside the 3rd ring road youre looking at a 1 or two bed flat, if you went 1 bed flat it would be a pretty nice flat. The apartment in the pictures in this post are our first apartment in Beijing and it looks a little run down, our second year was much nicer just a little smaller. The price ranges so massively from central and decreases significantly with each ring road further out you go. The allowance they are giving sounds like a pretty generous amount, It is usually around 4000RMB. Good luck! If you have any questions please let us know! Hello Katie, I am moving to Beijing in August. I was wondering if you had any luck finding apartments within the 4000RMB price range. I would really appreciate the help! I am moving to Beijing in August and I was wondering in what area did you find your apartment? 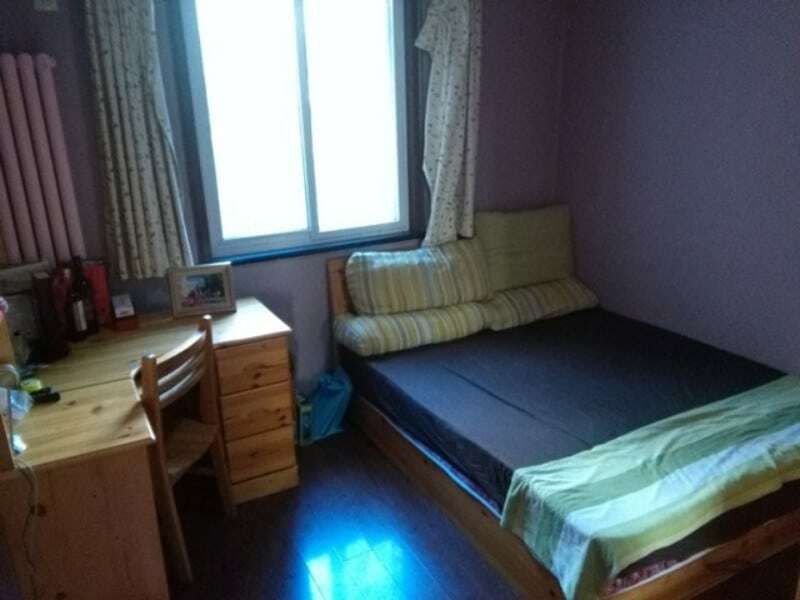 I was informed rent would be about 6000rmb a month! I don’t mind traveling to where I need to go. Also, I don’t need much space either. Do you have any recommendations on location? Thank you thank you in advance! Very sorry for the late reply, we lived outside the 3rd ringroad in a place called Fatou. Very close to a place called happy valley. Nice place to live and 30min train ride to the inner city. 6000RMB a month will get you a nice apartment down in that area. We went with a company called Ziroom. Give them a go.